4Media DVD Ripper Ultimate for Windows is a simple-to-use yet professional DVD ripping tool which is designed to enable users to easily rip DVD movies to virtually all video and audio formats with unparalleled ripping speed and quality. It supports many video formats including MPEG, AVI, WMV, MP4, DivX, H.264/AVC, MOV, 3GP, OGG MP3, AC3, M4A, WAV and more. With the DVD Ripper, you can enjoy your favorite DVD movies on wide variety of multimedia devices, like iPad, iPhone, iPod, Apple TV, PSP, PS3, PMP, 3GP mobile phones and etc. 4Media DVD Ripper Ultimate for Windows normally priced at $59.99 per single license. 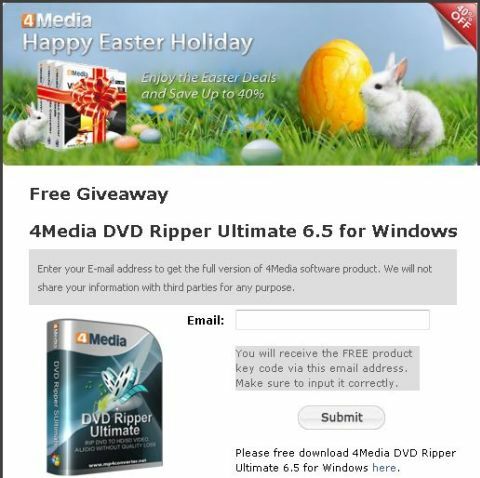 As part of 4Media Happy Easter Holiday promotion offer, the software studio is now giving away free licenses of 4Media DVD Ripper Ultimate 6.5 for Windows to its Facebook fans! Submit your email ID – Just the fans are entitled for this giveaway offer, click “Like” to join the party! An email which contains a registration license serial key of 4Media DVD Ripper Ultimate 6.5 for Windows will be delivered to your registered email address. Download the setup installer of the DVD ripping application: m-dvd-ripper-ultimate6.exe. Input your received free license serial code to activate it to a full version. 4Media DVD Ripper Ultimate 6.5 for Windows that includes an array of video editing capabilities is compatible with Windows 7, XP (SP2 or later) and Windows Vista operating systems.